1. 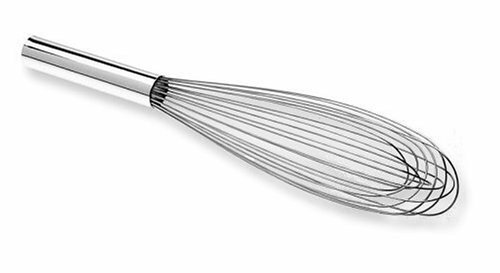 Whisk (n.) A mixing tool designed so its many strands of looped wire make it effective for beating. (v.) To beat with a whisk until well mixed. One day in the distant, murky past, someone grabbed a bunch of little twigs, held them in a bundle at one end, and used them to stir their food. The whisk was born. From those very humble beginnings comes the whisk we know today. 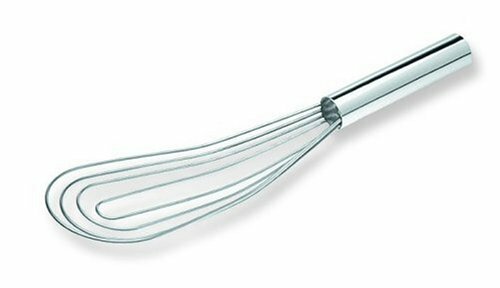 When someone says “whisk,” most of us think of a kitchen tool with a long, cylindrical handle holding wires loops. While this is still true, there are a wide variety of specialized whisks made out of a variety of materials that are available for us to use. First, let’s take a brief look at the history of the whisk and its function and then look at the varieties of whisks and decide if we need all of them or if there really is an all-purpose whisk out there. There is not a lot of information out there about the history of whisks, but I still stand by my scenario above. The first written mention of whisks came in The Frugal Housewife, a book published in London in 1765, although I am certain that the Japanese have been using bamboo whisks in tea preparation for centuries. Julia Child introduced Americans to the modern whisk in the 1960s. She probably held it up before the cameras during a taping of The French Chef, and Americans’ jaws dropped to the floor. What is that thing? And look how fast it whipped up that cream?! We had to have them, so we went and bought them. And as we bought them, companies kept making more and more, and different kinds so we would keep buying. While we all could probably spot a whisk in a lineup of kitchen gadgets, we might not all be aware of how they work. When you pull the thin wires of a whisk through liquid, such as egg white or cream, each wire creates a small vacuum behind it as it is pulled through. Air rushes in to fill this vacuum, and is thus incorporated into whatever we are whisking. The more wires a whisk has, the more vacuum streams are filled with air, and the more quickly your egg whites or cream will whip into a stable foam. Knowing that, it’s pretty easy to see that the more wires a whisk has, the better for creating a foam. Do we really need all these whisks? 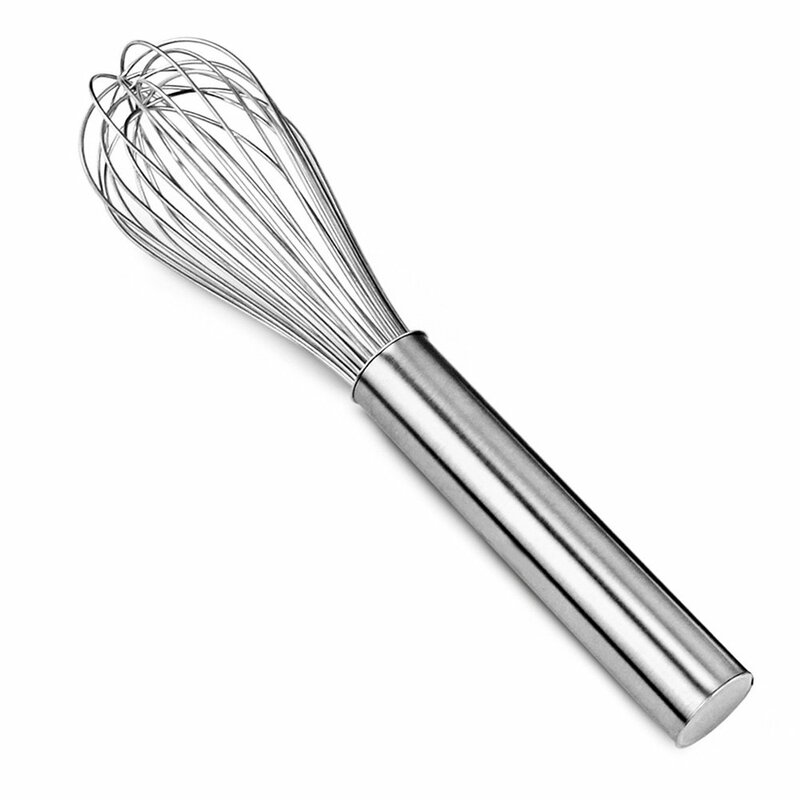 Whisks can be categorized in two basic ways: by number of wires and by shape. Round whisks with many wires are best for whipping air into liquids. 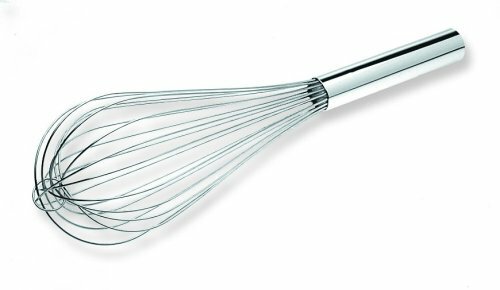 Flat whisks with fewer wires whip in less air and are better for mixing products that require a smooth, dense finish, such as sauces and gravies. Another variable that isn’t often addressed is the speed at which you whisk. The faster you whisk, the larger your vacuum streams, the more air rushes in to fill the vacuum and the faster you can whip up a stable foam. Whisk more slowly for a denser texture; whisk rapidly for a lighter texture. Balloon Whisk – The balloon whisk can have a very round shape or a more elongated tear-drop shape. The defining characteristic of the balloon whisk is multiple flexible wires arranged in a decidedly broad pattern at the business end and firmly connected at both ends to a handle. The balloon whisk is ideal for whipping up very stable foams quickly. French Whisk – Similar to a balloon whisk in that it has many wires attached at both ends. The French whisk differs somewhat from the balloon whisk in that its shape is less rounded. The French whisk is a wonderful all purpose whisk, great for mixing sauces or whipping whites, depending on the speed at which you whip with it. Piano Whisk – Similar in shape to a balloon whisk, the piano whisk generally has fewer wires, also making it a good all purpose whisk. Sauce Whisk – Also called a flat whisk or a roux whisk, a sauce whisk is characterized by three or four wires bent in a U shape in a single plane and attached at both ends to a sturdy handle. Because of its flat shape, a sauce whisk can stir on the bottom of a wide, shallow pan, scraping up the browned bits and making it a great tool for deglazing pans and emulsifying sauces. Vinaigrette Whisk – A vinaigrette whisk is a small whisk whose business end consists of one U-shaped wire with another wire coiled around it like a spring. A vinaigrette whisk is very useful for mixing and emulsifying small amounts of ingredients, as for a cup of dressing or a couple of eggs for an omelet. Twirl Whisk – Not your standard whisk shape, the twirl whisk consists of a handle with a continuous coiled wire, like a spring, at one end. The twirl whisk can be used by pushing up and down like a plunger or, as the name implies, by twirling the handle between your hands. Twirl whisks are often used to mix and foam beverages such as hot chocolate. 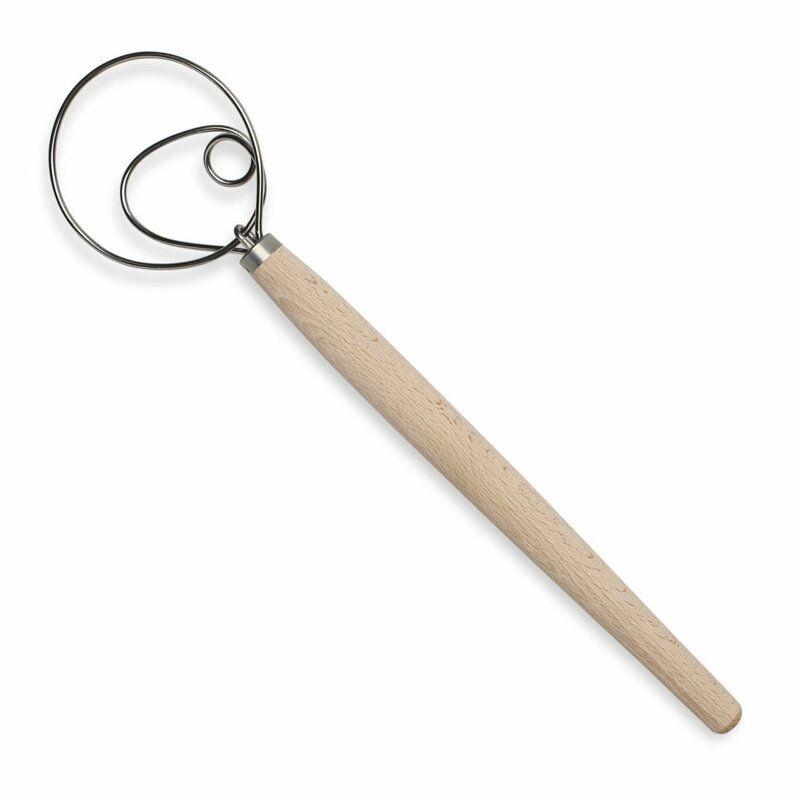 Dough Whisk -The dough whisk usually has a wooden handle. 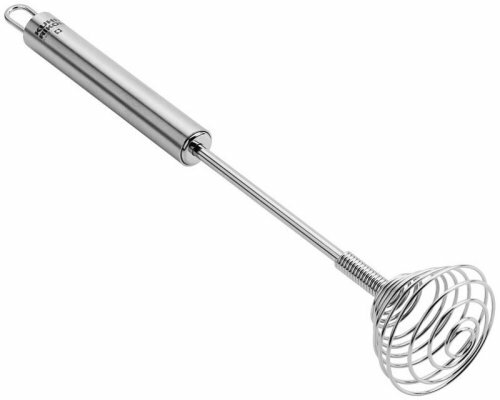 The whisk end is made of one wire coiled arranged in a flat spiral. 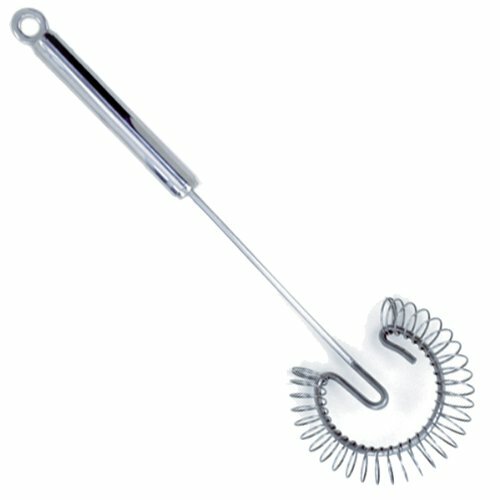 The dough whisk is ideal for mixing stiff doughs and batters. Ball Whisk – Picture a balloon whisk with all the wires snipped off at the ends. Now, put a little stainless steel ball at the end of each wire, and you get the ball whisk. The ball whisk is a relative newcomer on the whisk scene. Straight wires are attached to a handle at one end and tipped with a small ball. Some models coat the balls with silicone for use in non-stick pans. Ball whisks are good at getting into the corners of pans, and the weight of the balls causes the wires to oscillate as they are drawn through your ingredients. This increases the vacuum stream and can help you whip much more quickly and effectively. 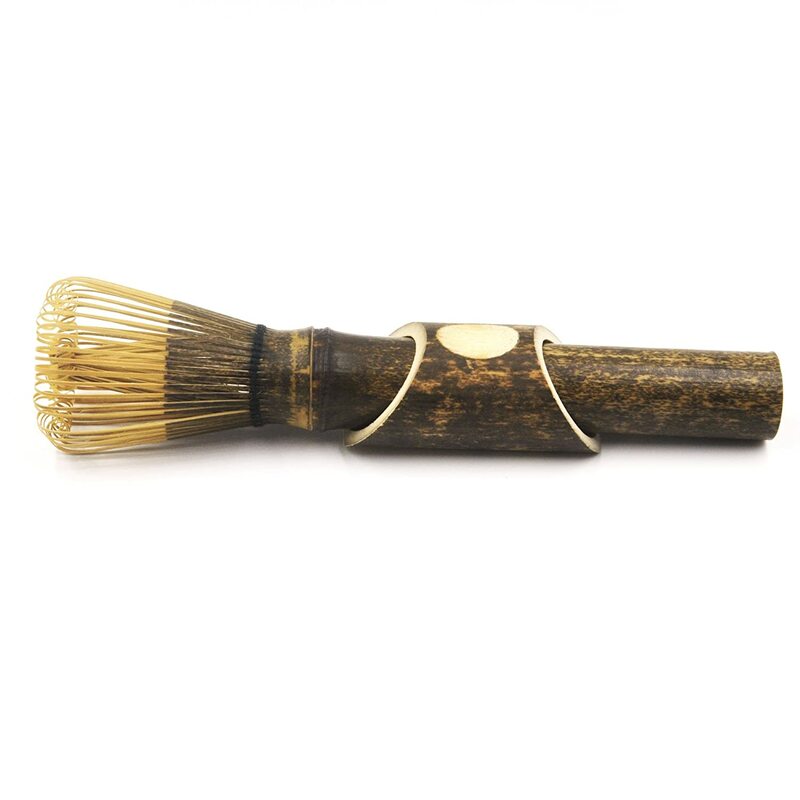 Matcha Whisk – Handmade from a single piece of bamboo and having between 80 and 120 prongs, the matcha whisk is used exclusively for whisking Japanese powdered matcha into a froth. There are other specialty whisks on the market, like the “ball in ball” whisk and the “double balloon” whisk. While these whisks will most likely get the job done, they are, by and large, novelties. Unless you’d like to go into whisk collecting, you probably don’t need to spend your money on one. If you have the space, I recommend owning a couple of sauce whisks, one large and one small, and a couple of round whisks—small and large balloon or piano. If you are working with limited space and aren’t a whisk aficionado, a good-sized French whisk is an all-purpose whisk that will meet your needs nicely. No matter how many whisks you buy, make sure that you buy good quality stainless steel whisks with the wires sealed into the handle. Since whisking is a repetitive motion, make sure that the handle is comfortable for you to grip. Check out my recipe for Chocolate Soufflé where you definitely will need a whisk to turn the egg whites into soft peaks. – Started out in the book business but now they sell just about everything. Good prices, ok service, these are the folks many of have done business with and feel comfortable with. A good compilation and touches on almost everything about whisks. I am surprised you did not add about spiral whisk. This article is a good piece of information though. Thanks! I want to find another whisk like my mom bought in the 70s or 80s. Rather than the wires just being shoved into the handle or into some plastic fitting with holes, the wires are actually welded together at the base and then I guess there is a rod underneath that that inserts into the handle which is then secure by a a small nail through the top part of the handle. The result is that the wires of the whisk never come loose and the whisk never pops out of the handle. It’s a way better design, and I can’t find any pics of this design online. 🙁 I wish I at least knew what I have here.